This certification program is for other professional coaches looking to add to their own toolkits. Based on my Intentional Leadership framework, I teach this along with my colleague, Ann Holm. 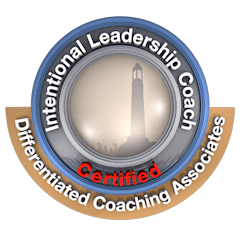 If you already have your International Coach Federation (ICF) certification, you can earn 12 continuing education credits after fully completing this program. If you are interested in bringing intentional leadership training to your work setting but you are not a coach, have no fear! Ann and I offer workshops and coaching on this topic as well. Complete and submit an Intentional Leadership Priority Focus for yourself and for a client, as well as a description of the process you used to coach the client. Specific goals. Start the process with your own goal. Example themes could include leading specific initiatives, transitioning to new positions, or developing skills such as project planning or time management. Personality Type. Work with this framework to clarify your strengths and related blind spots. Learn to go beyond the 4-letter code to understand your potential challenges and developmental strategies. Emotional intelligence. Explore the so-called “soft” skills from which as much as 70% of your success comes, and are often the hardest to develop. Polarity Thinking. Polarities occur when both sides hold part of the truth in a dilemma. Experience how polarity thinking tools access the power of “both/and” thinking, and learn how you can leverage polarities to get stakeholders to work together toward common interests. 12 Lenses of Leadership. Practice using identified polarities synthesized with information on your goals, personality type, and emotional intelligence to arrive at your personal Intentional Leadership Focus, which captures your priorities in key phrases that provide continuous guidance.